Although it's often said that commercial fishing is one of the most dangerous jobs in America, most workers come back safely. The major categories of fishing industry jobs include: off shore vessels, near shore vessels, and floating processors (called "floaters") that also operate near the shore processing seafood. During the summer, the majority of boats are small, near shore vessels harvesting salmon. These boats are usually independently owned and crews of these boats vary from one to six members; thus, employment can be difficult to obtain since jobs are few and usually given to friends and family of the owners. What you need to know are the insider strategies for getting the jobs that are available - many boat captains take on newcomers every year (see our list of online resources below)! The larger boats, which often target whitefish and king crab, are usually corporately owned and may operate year round. The majority of these types of boats are based out of the Pacific Northwest and in many cases are fully staffed before they arrive in Alaska. If you are looking for non-Summer employment check out crab fisheries, which generally operate in September, November, and January in the Bering Sea. An employment option for those without their sea legs is cold storage facilities or salmon cannery jobs that are located throughout the State in coastal areas. On board life is not for those who require a lot of downtown or time alone. Generally, boats are at sea for six to eight weeks at a time with 10-18 hour work days, six to seven days per week. Throughout their time onboard, crewmembers sleep, eat, and shower without much privacy. Physical and mental fitness is a must given that crewmembers are required to stand for long hours, move heavy objects, and exist without going on land for several weeks. Most importantly, prospective employees must understand that this job can be dangerous: vessels are equipped with large, heavy machinery and at times, can encounter rough waters making for a hazardous combination. Although cannery jobs are on land, these positions are similar to onboard positions in the sense that hours are long, the work is monotonous, and communal living conditions may not be ideal for everyone. If you are without experience, companies usually hire new workers to work as processors in the factory and then later promote employees to deckhand positions. Wages greatly vary depending on what kind of vessel you are on (large or small) and what you are catching. In most cases, crewmembers are not paid hourly; rather, they are paid a "crew share" - often calculated at 1-10% of the net value of the harvest. So the more fish you catch, the more money you make, but the percentage depends on location and your position on the book (newcomers will earn less than a seasoned worker). The formula works well in some years and not in others depending on restrictions and availability of fish and the market. Thus, it may be more profitable to find one of the few vessels that offer daily rates of $50 to $100 instead of the standard crew share. In a summer, a salmon boat crewmember can earn anywhere from $5,000 to $10,000. Earning potentials are highest in the Bristol Bay, Alaska Peninsula, and Chignik fisheries. The best part is that you will take home all your earnings (after expenses) since you are on the boat where housing and food is provided and there is nowhere to spend money on the water. In contrast, those who work on floaters or canneries are most likely paid by the hour (often minimum wage; $9.80 in 2017) instead of crew share; but are usually offered housing at the facilities - and overtime earnings can be significant. The only costs associated with these positions are a few items that onboard crewmembers are expected to own (such as weather gear, boots, gloves, and sleeping bag) as well as crewmembers are often required to supply their own commercial fishing licenses that costs $60 for Alaskan residents and $200 for non-residents. Hiring for summer jobs begins in early spring each year. Salmon boats are your best bet as they offer the largest amount of entry-level positions and experience working on a salmon harvesting boat will later make it possible to work on multiple types of vessel. If you really want to do this type of work, but know little about it, then check into industry job boards and research companies like the AlaskaJobFinder. They offer a membership for $3.95 that will allow you to post your resume and apply for jobs, plus they explain the entire industry in terms anyone can understand. 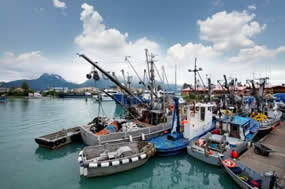 The state of Alaska maintains several websites dedicated to fishing industry jobs. They first recommend their own website for your job search: http://alexsys.labor.state.ak.us in order to ensure that you apply for a job with a reputable boat company. Next, the State recommends that if you are in Alaska, to visit the ports of Kodiak, Soldotna, Ketchikan, or Petersburg and walk the docks in order to apply for jobs in person. Another suggestion is to post a notice stating your desire to work and your qualifications with the local harbormaster in the area. If you are in Alaska, your best resource may be the Anchorage Employment Service Seafood Office, which offers orientations twice a day (Monday through Friday) and then provides seafood job listings for those who completed the orientation. This office also has a job hotline (907-269-4770 ext. 7) for those who are not in Anchorage. The State website also offers a list of over 700 seafood processors, buyers, and exporters. It is recommended that you contact their representatives to inquire about available positions. Many of the larger off shore companies have recruiters specifically for hiring seasonal workers. Copyright © 2002 - 2019 - ALASKA-SUMMER-JOBS.COM - All Rights Reserved.